This detailed account of the Wordsworths' domestic life allows us a fascinating view into the home of the great poet, his family and friends, shared in the Lake District during the early 19th Century. The book includes over 100 recipes of the best Lakeland fare taken from manuscript recipe books of the Wordsworth, Hutchinson, Fricker and Coleridge families and exposes the truth behind Wordsworth's claimto be a 'simple water-drinking bard'. In the competitive world of Wordsworth studies where every vestige of the great poet’s life has been combed through again and again and you would think there was nothing left to say, food historian Peter Brears has found something new for scholars to get their teeth into. His delightful study of the domestic economy practised at Dove Cottage and Rydal Mount presents the poet in a new light. One servant recalls that “It was poddish for t’breakfast, and a bit o’mutton for t’dinner, and poddish at night, with a bit of cheese happen to end up wi’. “ Mary, his wife, or his sister Dorothy would sometimes resort to dropping a dish outside the study door in order to get him to come to table. Peter has been able to use three notebooks where the ladies of the Wordsworth circle kept details of their recipes for everything from cooking eels to making ink. Joanna Hutchinson has a no-nonsense way with eels. “Case the eels, cut off the heads, slit open the bellies, cut off the Fins, & take out the Guts & bone lay the flat on the Back”. Then it’s nutmeg and mace, salt and pepper and sage and parsley and boil for three quarters of an hour before pickling. In Dove Cottage they enjoyed mutton broth, shank broth (“cheap and nourishing”), Coleridge stew (any meat with peas, turnips and onion and rice), jugged pigeons, calf’s head, giblet pie and stuffed and baked pike. Cold sweets were a favourite, although in the days before manufactured gelatins, making jellies beginning with a calf’s feet was a long and slow process. There was blancmange and jaune mange, and yellow flummery and a simple and tasty lemon cream. On a cold evening, the Wordsworth’s might have enjoyed a boiled batter pudding, a plum pudding, gooseberry, apple or apricot pies, or raspberry fritters. Cakes and breads were baked weekly and the household brewed its own beer and made gooseberry, ginger and raisin wine. There was generally fairly rich fare available, all made from local resources and Wordsworth seems to have survived on something more substantial than toast and porridge. If he should have suffered from indigestion, Dorothy had a tonic for the stomach made from lemon and orange pale and “snepe root”, or snake root. And if anyone suffered from chilblains because of huddling round the fire on those cold winter evenings in Grasmere, there are recipes for oils and potions that can be applied to the itching, irritating parts. Peter Brears’ s book is a delight. 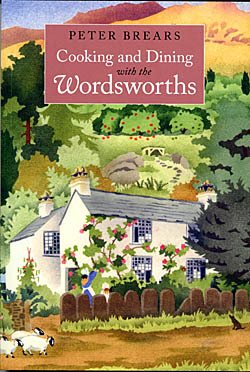 It is both scholarly, drawing on a vast knowledge of the history of food, and entertaining offering so many images of everyday life in the Wordsworth household. And it is eminently practical with the many recipes for forgotten or neglected local dishes that could make a welcome return to Cumbrian tables.